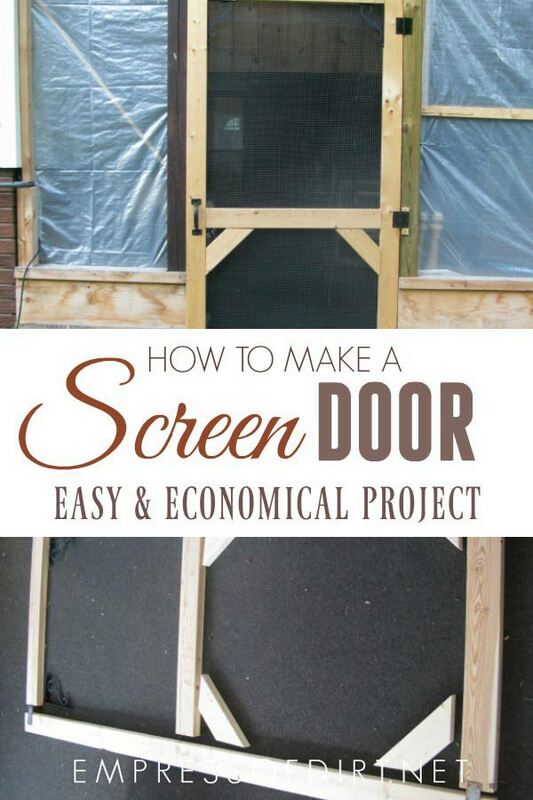 This shows how to make a simple screened patio door using basic tools and lumber. After making this project, I added screening for the summer and vinyl sheeting for low-cost winterizing. Our covered patio needed a screen door. The door area was a non-standard size so I did what any overly optimistic and seriously unskilled carpenter would do. I made one myself. I couldn’t find any plans that suited my needs on the internet, so I opted to make up my own. I came up with a design that could be precut at the lumber store and assembled at home and spent about $35. I used 2×4 wood lumber. It’s a bulky choice but it also makes a nice, solid door. If you’re going to paint or stain the wood, do it before assembly if you can. When you measure for the final size of the door and calculate the wood dimensions, note that 2×4″ wood is actually 1.5×3.5″. Sketch the whole thing out first. Measure three times, cut once. The short reinforcement pieces you see in the lower section of the door are cut with the ends at 45º angles . 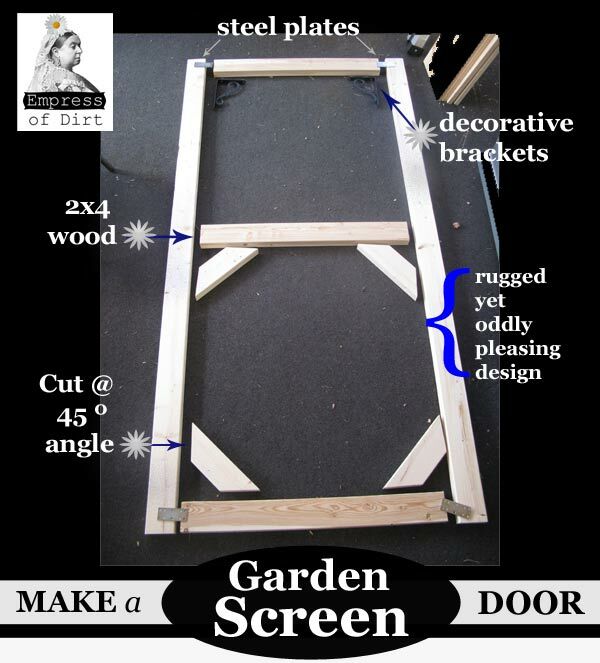 You’ll need two handles (one inside, one outside), three hinges, and four steel plates to reinforce the outer corners (fixed in place with 3/4″ wood screws). TIP: Always predrill your screw holes to prevent the wood from splitting. I used 2.5″ deck screws and inserted them at all the joins at 45º angles, to avoid drilling through the entire width of the wood. Also, if you can, use a pocket hole jig for the joins. I didn’t have one when I made this door, but started using one later and they are great. There’s several options for screening. You could use proper window screening, poultry net, or hardware cloth. I used leftover poultry net but the chipmunk has already nibbled himself a little opening in it so I’m going to upgrade to the same mosquito-proof screening I’ll be using for the window areas of our patio. I mail ordered it from this store. 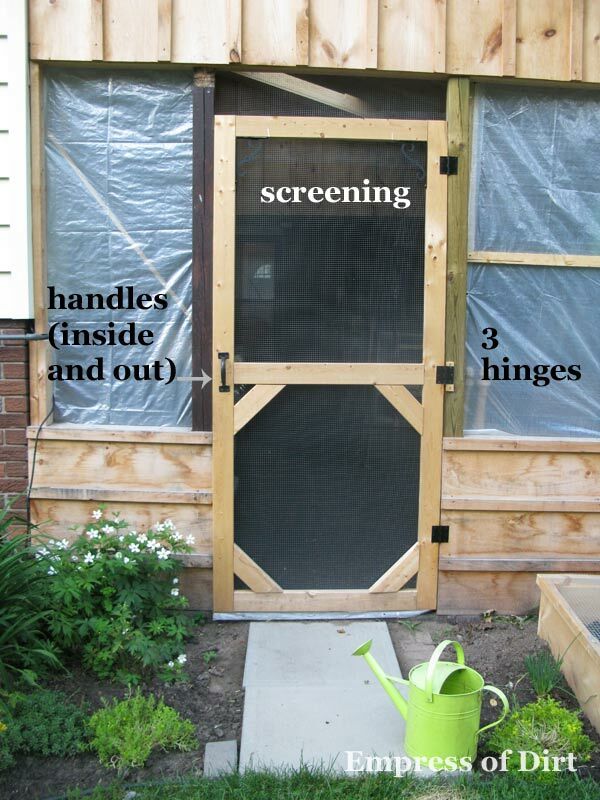 I stapled my screening to the inner side of the door. You could add mitered wood strips around the edges to hide the staples. I’ll also be adding vertical door stops. These are strips of wood you see on most door frames, providing a stopping point for the door and concealing any slight gaps between the door and the frame. I’ll also add a threshold piece. This diagram shows the names of door parts. If you’ll want to lock or latch your door, look at options available at your hardware store and plan accordingly. As I said, I’m no carpenter, but I hope this helps. I assure you, if I could do this, you can too. So far the door works great and the Starlings have not managed to get into the patio area since I’ve installed it. The chipmunk is another story. Updates: After photographing the door, I added screen to the patio where you see the plastic sheeting and stained all of the wood. It’s now a fully-enclosed, bug-free patio. And the only way the chipmunk gets in is if he sneaks through the door when it’s open. Since then I added vinyl sheeting to winterize the patio, keeping the wind, snow, sand, and rain out.